I am Harriet Tubman (Ordinary People Change the World) (Hardcover) | novel. This friendly, fun biography series focuses on the traits that made our heroes great--the traits that kids can aspire to in order to live heroically themselves. Each book tells the story of one of America's icons in a lively, conversational way that works well for the youngest nonfiction readers and that always includes the hero's childhood influences. At the back are an excellent timeline and photos. This volume focuses on Harriet Tubman's brave heroism as part of the movement to abolish slavery. As one of the key players in the Underground Railroad, she helped enslaved African Americans escape and find freedom. 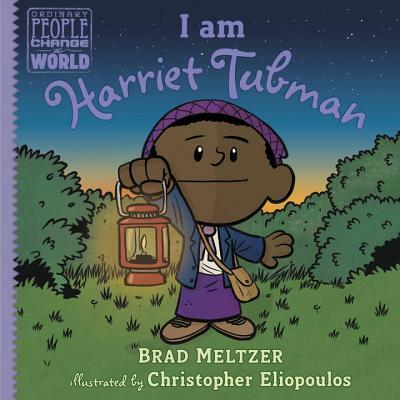 Brad Meltzer is the New York Times bestselling author of Heroes for My Son, Heroes for My Daughter, and a number of suspense novels like The House of Secrets. He is also the host of the History Channel television shows Brad Meltzer's Decoded and Brad Meltzer's Lost History. He lives in Florida with his wife and their three children. Christopher Eliopoulos began his illustration career at Marvel Comics, and has worked on thousands of comics, including Cosmic Commandos (Summer 2017), Franklin Richards: Son of a Genius, Pet Avengers, and Cow Boy, all of which he wrote and illustrated. He lives in New Jersey with his wife and their identical twin sons.